Endnote itself offers a huge collection of databases & catalogues, but should you still be looking for more sources, then maybe you can check out Google Scholar. 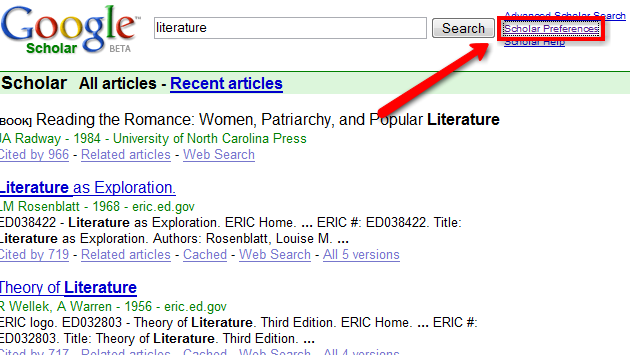 First, navigate to http://scholar.google.com en enter a search string. On top of your screen, click on Scholar Preferences. In the Bibliography manager section (right at the bottom of the list) select Endnote in the pulldown menu. Don’t forget to click on . Selecteer daar in het uitklapmenu Endnote en klik rechts onderaan vervolgens op save preferences. Each search result can now be imported into Endnote X (and higher)! Ik kan helaas geen bookmark aanmaken naar faph.wordpress.com in Firefox. 😦 Weten jullie hoe dit komt?